The British army has been largely exonerated of blame for Bloody Sunday which ended in the deaths of 14 civilians in Northern Ireland. 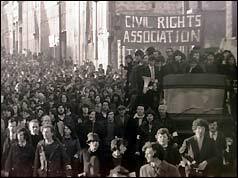 A report into the events which followed a civil rights march in Derry in January said the Army's operation was justified. The report by the Lord Chief Justice, Lord Widgery, stated that if the illegal march - protesting against internment without trial - had not taken place there would not have been any deaths. The trouble began after the crowd of between 7,000 and 10,000 demonstrators was halted at an army barricade. Lord Widgery accepted the Army's claims that the 1st Battalion Parachute Regiment came under fire before soldiers retaliated and that some of their victims had been armed. "There is no reason to suppose that the soldiers would have opened fire if they had not been fired upon first," he said. However, his report also said their firing had "bordered on the reckless" and criticised individual, but unnamed, soldiers. The report has been welcomed by the British Government. The Defence Secretary, Lord Carrington, said in the light of the report's findings no disciplinary action would be taken against any individual. There are also no plans to modify the soldiers' "Yellow Card" which sets out instructions as to when they may fire their weapons. However, Lord Widgery's report has been condemned for inconsistencies and lacking eyewitness testimony. SDLP MP John Hume said Lord Widgery's conclusions were a "whitewash" and called for his resignation. "I think within a very short time when the independent press gets to work on what actually happened that day and examines Lord Widgery's conclusions he'll find himself a very embarrassed man," Mr Hume said. A Catholic priest, Father Edward Daly, who took part in the march and gave evidence that soldiers had shot at unarmed men, said he was disappointed by the report. "I think that Lord Widgery was biased in many instances," Father Daly said. In August 1973 an inquest jury returned an open verdict on the 14 people who had died. The coroner, Major Hubert O'Neill, accused the British army of "sheer unadulterated murder". The inquiry, headed by Lord Saville, began hearing evidence in April 1998. It took statements from hundreds of witnesses including, in January 2003, the prime minister at the time Edward Heath. The inquiry, headed by Lord Saville, spent two years taking witness statements. It ended in November 2004 and had cost about £150 million. **Lord Saville's final report and conclusions were not expected to be made public until summer 2005; however, that deadline was extended. # posted by SAOIRSE32 : 3:50 a.m.